This was published as a Wall Street Journal Think Tank column on September 25, 2014. 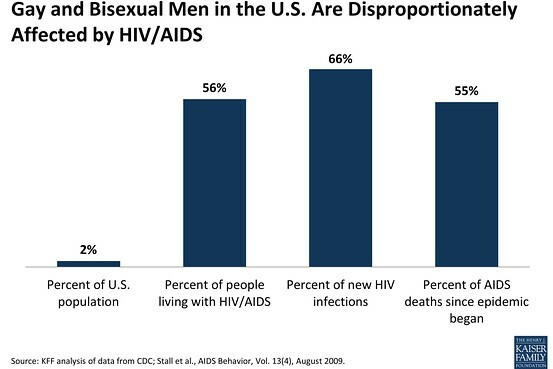 Gay and bisexual men represent an estimated 2% of the U.S. population but more than half of all people living with HIV and 66% of new HIV infections. They are the only population group in the United States for which HIV infections are rising. Projections have shown that if current trends continue, half of all gay and bisexual men will be HIV-positive by age 50. So it’s a major concern that, according to a Kaiser Family Foundation survey published Thursday, only a third of gay and bisexual men know that infections are increasing among this group. Only a quarter know that if someone who is HIV-positive is taking HIV antiretroviral treatment, his risk of passing on the virus is significantly reduced. The Centers for Disease Control and Prevention recommends testing every three to six months for sexually active gay and bisexual men; many state health departments do as well. But almost a third of gay and bisexual men have never been tested for HIV, and another third were tested more than a year ago. More than half don’t know about pre-exposure prophylaxis (PrEP)–a pill that HIV-negative men can take to prevent infection that is about 90% effective when taken every day. Discrimination and stigma are still barriers to spreading the word about testing and new treatments among gay and bisexual men, and there is no one-size-fits-all approach for such a broad, diverse community that encompasses 40-year-old white men in San Francisco and teenage African American high-school students just coming out in, say, Texas. There has also been discussion about how widely PrEP should be used by HIV-negative gay and bisexual men. The message about PrEP is almost certainly best spread in the context of a comprehensive approach to prevention and treatment. One attempt to do this right is Speak Out, part of the national Greater Than AIDS campaign–that the Kaiser Family Foundation has helped to lead–that focuses on groups at greatest risk of HIV infection. Whatever the approach, there is no question that the problem of HIV among gay and bisexual men remains urgent–and under the radar.